In the latest episode of Cairo’s Maspero triangle saga, The residents and shop owners of Buildings at 26 July street of Boulaq Abu Ela are trying to fight a demolition order. When a customer visited S. Hinhayat Watches to fix his watch one morning, Essam Solomon told him that he should take his business elsewhere. The shop's workers had left, and technically Solomon was off work for at least two weeks until he finds out whether Egypt’s oldest watch shop would be demolished. 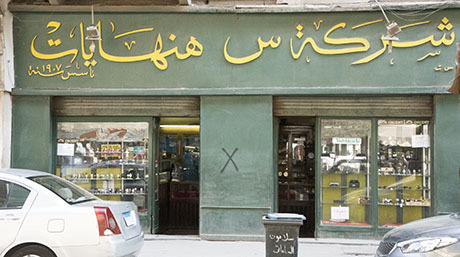 S. Hinhayat Watches has been operating since 1907, and is situated at the bottom of building 54, a four-storey building on 26 July Street in the famous Boulaq Abul-Ela area. “This is the oldest watch shop in Egypt, and maybe the entire Arab world,” said Essam Abdullah, or Essam Solomon as he calls himself after the shop's founder Solomon Hinhayat, whose image hangs in the shop and serves as a time capsule to the 1940s. Abdullah recounts to Ahram Online the story of the Jewish Bulgarian khawaja (Arabic for foreigner) and the history of his shop. “Hinhayat opened the shop in 1907; one year after the building was constructed,” Abdullah said. Soon after the shop was opened, the crème de la crème of Egyptian society became patrons, including members of the Royal House of Mohamed Ali and British high commissioners in Egypt. The shop employed mostly Bulgarian nationals, with the exception of a few Egyptians, including a skilled young man named Ahmed Sayed Mostafa, Abdullah's grandfather, who caught the attention of the Egyptian royal palace when he fixed King Fouad’s watches. Hinhayat had planned to open a clock and watch factory under the name “Nomolas Watches,” but he left Egypt after the creation of the state of Israel in 1948 and Egypt's subsequent war with the new country. Abdullah does not know what became of Hinhayat, only that his grandfather acquired the shop and kept the name of his mentor as a sign of appreciation. Abdullah continues to honour Solomon today by adopting his name as his own. Over the decades, S. Hinhayat Watches was patronised by kings, princes, ministers, diplomats, pashas, landlords as well as ordinary Egyptians hailing from villages to visit the shrine of Sufi icon Sultan Abul-Ela a couple of blocks away. While most other shops in the area have shifted their business to selling cheap imported second-hand clothes, S. Hinhayat Watches has for over a century maintained its identity as a watchmaker. According to the owner, the shop's building is now in danger of being demolished within days, and municipal workers have already started dismantling the top floors of the building. Abdullah has emptied the store of all its valuables and old photos and documents with the help of his wife Aya. Over the past few months, government workers have been demolishing buildings in the Maspero Triangle area, on the edge of which the S. Hinhayat Watches building is situated. The Maspero Triangle development project is an ambitious plan to turn the slum area in the heart of Cairo into a modern financial and residential hub attracting local and foreign investments. After years of negotiating with the residents of Maspero, the government has managed to evacuate them in exchange for compensation and alternative residences. However, some buildings in the area are excluded from the demolition orders, including the headquarters of Egypt’s state TV and radio building, the Hilton Ramses hotel, the old Italian consulate, the headquarters of Egypt’s foreign ministry, the Mosque of Sultan Abul-Ela, and the Royal Carts Museum, which is undergoing restoration. According to public statements by government officials, the old Parisian and Italian-style buildings on 26 July Street will not be among the building demolished and will be renovated. Despite this, however, uncertainty still looms about the fate of building 54. On 22 July, municipal workers started to demolish the upper floors of the building. “The workers came suddenly and rudely told us that they were going to demolish the whole building over our heads,” Abdullah said, adding that he and other residents and shop owners then called the police for help. Abdullah said that the demolition was temporarily stopped, but resumed the next day. According to Abdullah and his wife, after the deadly earthquake of 1992, an official order was issued to remove two floors from the building and to renovate it. This order was ignored by the building's owner, who is currently out of town, and was shelved by district officials for two decades. The order was then renewed on 23 January 2018. “The workers did not come to demolish just two floors, they came to demolish the whole building,” Abdullah said. Abdullah and other shop owners in the building say that the workers deliberately broke the building’s water pipes to damage the infrastructure, forcing the shop owners to turn off the water. “They also throw the debris and rubble from other demolished buildings in Maspero on the building 54’s back lot, destroying one of the workshops there,” Abullah's wife told Ahram Online. The workshop belonged to Hajj Hosni, one of the oldest mannequin manufacturers in the country. Hajj Hosni, who is in his late 80s, said his workshop was destroyed on 22 July. “I had an order of mannequins to finish for a company in Spain, and now everything is gone,” the fragile elderly man, who can barely stand, said while he and his workers inspected the damage at his old workshop. Starting as an assistant to Egypt’s top sculptors, Hajj Hosni opened his shop to make mannequins from scratch instead of importing them.Almost all the mannequin makers in the country learned their craft from him. “Everything is gone now, I do not have a pension,” the old man said angrily while his workers helped him navigate around the debris in the back lot. Hajj Hosni's anger is shared by Dr Hany Makram, the owner of a pharmacy that has been operating in the building since 1950. The pharmacy’s warehouse and laboratory have also been destroyed. The building's residents, all of whom are all old pensioners, have left the building and moved in with their offspring. The fight to preserve the building is now headed by the shop owners, who say they cannot reach the building's owner or their parliamentary representative. They have also gained the support of people in neighbouring buildings, who also fear demolition. The residents of the old buildings in the area have set up a Facebook page called 'The Residents of 26 July,' demanding that they be left alone. “You cannot compare our situation to that of the people who lived in Maspero Triangle’s shanty town,” said Ahmed Abdel-Fattah, the administrator of the Facebook page, who lives in a building on 26 July Street. In statements to Mantiqiti local news website a week ago, the head of the Informal Houses Development Fund Khaled Sadik said that no official decision has been made yet regarding the buildings on 26 July Street. According to media reports, officials have said that 13 of the buildings in the area will not be demolished given their unique architectural style. Some of these buildings currently stand alone in a vast area where the Maspero slum area once stood. Local residents say that the buildings in the Maspero Triangleare divided into three categories: A, B and C.
The ‘C’ category comprises buildings that will not be demolished and will undergo renovation. The residents of the 26 July Street say that building 54 is in the ‘C’ category like other buildings on the street, and that it is registered with the culture ministry’s National Organisation for Urban Harmony. The National Organisation for Urban Harmy’s mission is to maintain to the exterior of heritage buildings in the country, especially in Cairo. The National Organisation for Urban Harmony told Ahram Online that the status of these buildings has not been determined. Essam Solomon has filed a legal case with administrative court to prevent the demolition of his shop based on the earlier decisions ordering that the building be restored. Other residents have also filed legal cases of their own, but they fear that time is not on their side. “A group of residents in Maspero had won a suit filed with the administrative court revoking an eviction and demolition order for their building; however, their building was demolished regardless,” said Ahmed Abdel-Fattah, who lives on 26 July Street. Abdullah now prays that he can win this race against time and preserve his 111-year-old business and pass it on to his children, just like his father and grandfather had done.